Where's the infrastructure funding, President Trump? President Trump wants to spend up to a trillion dollars to build and repair America's highways, bridges and tunnels and other construction projects. Included in the general category of infrastructure projects are schools, colleges and universities, water treatment facilities, public hospitals and community development. Stocks in the heavy construction industry that are in line to benefit from these spending programs: Argan (AGX - Get Report) , Dycom Industries (DY , Emcor (EME - Get Report) , Comfort Systems (FIX - Get Report) , Granite Construction (GVA - Get Report) , and Jacobs Engineering (JEC - Get Report) . Argan provides engineering, construction and management services primarily to the power generation and renewable energy industries. The company reported quarterly earnings back on Dec. 6 and beat analysts' earnings per share estimates. The stock trades at $73, up 3.5% year to date and is in bull market territory 34.1% above its post-election low of $54.45 set on Nov. 9. The stock set its all-time intraday high of $76.70 on Jan. 25. Dycom Industries provides contracting services such as construction, maintenance, and installation services. The company reports quarterly earnings on Feb. 28 and analysts expect the company to earn 69 cents a share. Back on Nov. 21 the company beat estimates but offered weak guidance, which caused the stock to lose all or its post-election gains. The stock trades at close to $80-, down just 0.7% year to date and up 13.4% since its post-election low of $70.33 set on Nov. 22. The stock is deep into correction territory 19% below its all-time intraday high of $98.45 set on Aug. 8. Emcor provides general electrical and mechanical construction services. The company reports quarterly earnings on Feb. 23 and analysts expect the company to earn 83 cents a share. The stock gapped higher on Oct. 27 following a better-than-expected earnings report on Oct. 26. This was a positive backdrop for the share price rally that followed the election. The stock trades around $69.70, down 1.5% year to date, but it's up 15% from its post-election low of $60.60 set on Nov. 8. The stock set its all-time intraday high of $73.44 on Dec. 12 and is 5.1% below this price level. Comfort Systems provides general mechanical and maintenance services. The company reports quarterly earnings on Feb. 28 and analysts expect the company to earn 47 cents a share. The stock began to accelerate higher following earnings reported on Oct. 27. The stock trades near $34, up 1.4% year to date and 18.8% above its post-election low of $28.40 set on Nov. 8. The stock set its all-time intraday high of $35.25 on Dec. 27. Granite Construction is a heavy civil engineering contractor and construction materials provider. The company reports quarterly earnings on Feb. 23 and analysts expect the company to earn 53 cents a share. The stock began to accelerate higher following earnings reported on Oct. 28 despite missing earnings-per-share estimates. The stock trades at $56, up 1.8% year to date and 18.5% above its post-election low of $47.25 set on Nov. 8. The stock set its all-time intraday high of $62.18 on Nov. 25, so the stock is in correction territory 10% below this level. Jacobs Engineering provides technical, professional and construction services. The company reports quarterly earnings on Feb. 28 and analysts expect the company to earn 63 cents a share. The stock trades near $59, up 3.2% year to date and 19.7% above its post-election low of $49.17 set on Nov. 8. The stock set its all-time intraday high of $63.42 on Nov. 30, and the stock is 7.2% below this price level. Here's a scorecard for the six infrastructure stocks followed by their weekly charts and key trading levels. The weekly chart shows a red line through the price bars, which is the key weekly moving average (a five-week modified moving average). 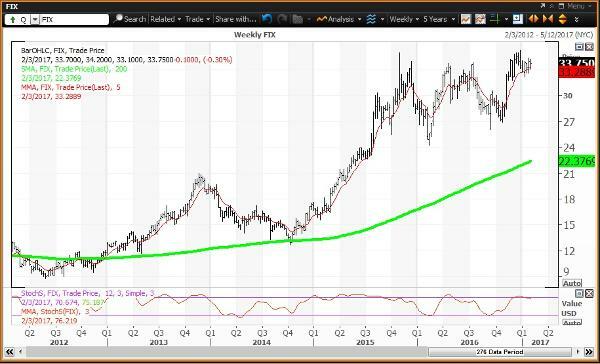 The green line is the 200-week simple moving average considered the "reversion to the mean." The study in red along the bottom of the charts is weekly momentum (a 12x3x3 weekly slow stochastic), which scales between 00.00 and 100.00, where readings above 80.00 indicates overbought and readings below 20.00 indicates oversold. A negative weekly chart shows the stock below its key weekly moving average with weekly momentum declining below 80.00 in a trend towards 20.00. 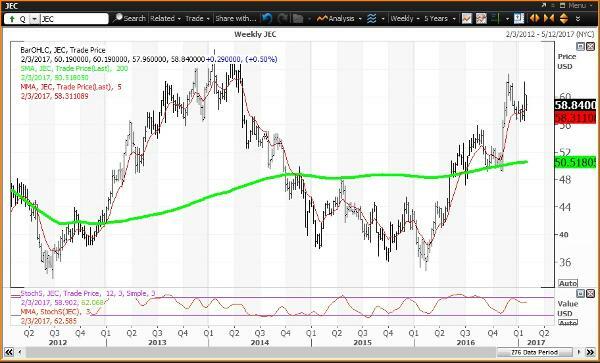 A positive weekly chart shows the stock above its key weekly moving average with weekly momentum rising above 20.00 in a trend towards 80.00. 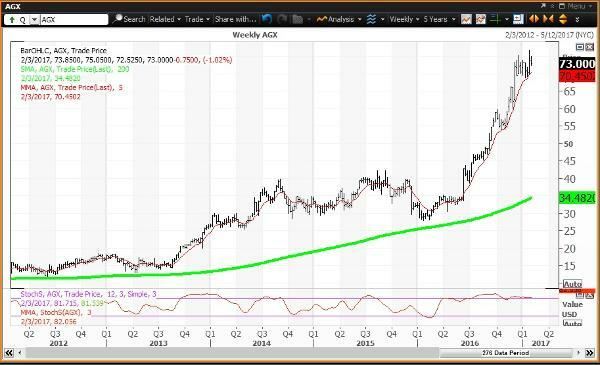 Here's the weekly chart for Argan. 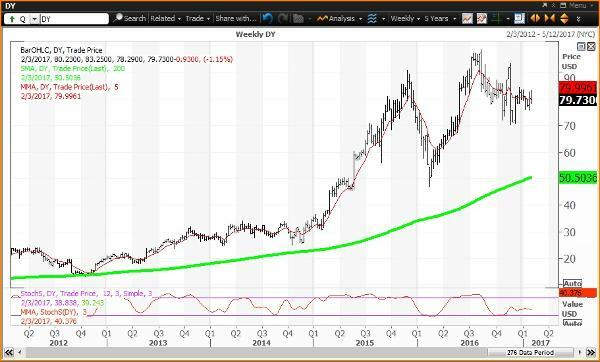 The weekly chart is positive but overbought with the stock above its key weekly moving average of $70.45 and well above its 200-week simple moving average of $34.48. The weekly momentum reading is projected to slip to 82.06 this week down from 82.23 on Jan. 27, with both readings still above the overbought threshold of 80.00. Investors looking to buy Argan should do so on weakness to $64.47, which is a key level on technical charts until the end of June. Quarterly and annual value levels lag at $59.71 and $53.55, respectively. Investors looking to reduce holdings should consider selling strength to $83.08, which is a key level on technical charts until the end of February. Here's the weekly chart for Dycom Industries. The weekly chart is negative with the stock just below its key weekly moving average of $80.00, but well above its 200-week simple moving average of $50.50. The weekly momentum reading is projected to end the week at 40.38 down slightly from 41.15 on Jan. 27. Investors looking to buy the Dycom should do so on weakness to $71.10, which is a key level on technical chart until the end of 2017. I show a monthly pivot of $79.22 for February. Investors looking to reduce holdings should consider selling strength to $90.53, which is a key level on technical charts until the end of June. Here's the weekly chart for Emcor. The weekly chart is neutral but shifts to negative given a close on Friday below its key weekly moving average of $69.35 and well above its 200-week simple moving average of $46.90. The weekly momentum reading is projected to decline to 73.31 this week down from 78.56 on Jan. 27, trending below the overbought threshold of 80.00. 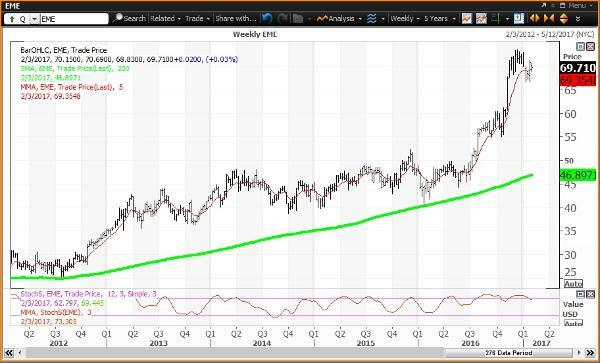 Investors looking to buy EMCOR should do so on weakness to $67.32, $65.08 and $63.41, which are key levels on technical charts until the end of June, the end of 2017 and until the end of March, respectively. Investors looking to reduce holdings should do so on strength to $77.30, which is a key level on technical charts until the end of February. Here's the weekly chart for Comfort Systems. The weekly chart is neutral but shifts to negative given a close on Friday below its key weekly moving average of $33.29. The stock is well above its 200-week simple moving average of $22.38. The weekly momentum reading is projected to decline to 76.22 this week down from 78.99, trending below the overbought threshold of 80.00. Investors looking to buy the Comfort Systems should do so on weakness to $30.82 and $29.32, which are key levels on technical charts until the end of February and until the end of 2017, respectively. Investors looking to reduce holdings should consider selling strength to $36.23 and $40.64, which are key levels on technical charts until the end of June and the end of March, respectively. Here's the weekly chart for Granite Construction. The weekly chart is neutral but shifts to negative if the close on Friday is below its key weekly moving average of $56.01. The stock is well above its 200-week simple moving average of $38.08. The weekly momentum reading is projected to decline to 63.47 this week down from 66.76 on Jan. 27, trending below the overbought threshold of 80.00. Investors looking to buy the Granite should do so on weakness to $50.05, $49.20 and $32.59, which are key levels on technical charts until the end of March, the end of June and the end of 2017, respectively. Investors looking to reduce holdings should consider selling strength to $61.18, which is a key level on technical charts until the end of February. Here's the weekly chart for Jacobs Engineering. 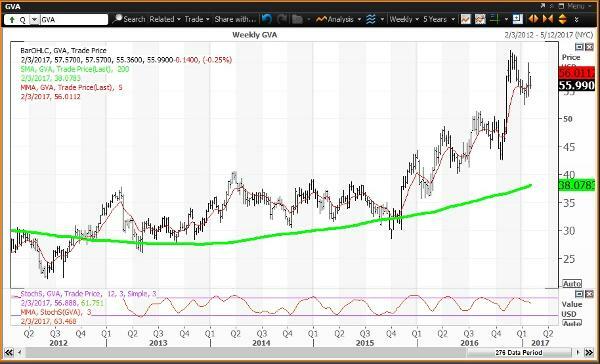 The weekly chart is neutral but shifts to negative given a close on Friday below its key weekly moving average of $58.31. The stock is above its 200-week simple moving average of $50.52, last tested as the "reversion to the mean" during the week of Nov. 11, when the average was $50.01. The weekly momentum is projected to slip to 62.59 this week down from 64.42 on Jan. 27. Investors looking to buy Jacobs should do so on weakness to $49.59 and $47.51, which are key levels on technical charts until the end of March and the end of 2017, respectively. Investors looking to reduce holdings should consider selling strength to $59.41 and $60.20, which are key levels on technical charts until the end of February and until the end of June, respectively.